"Inchworm, inchworm, measuring the marigolds…"
That classic children's song refers to the larvae of the geometer moths. The family name Geometridae comes from the Greek geo, meaning earth, and metron, meaning measure. These forest caterpillars serve as an important source of food for birds. Geometer moths may be easiest to identify in the larval stage, thanks to their unusual appearance. The caterpillars bear just two or three pairs of prolegs near their hind ends, instead of the five pairs found in most butterfly or moth larvae. With no legs in the middle section of its body, a Geometer moth caterpillar moves in a looping fashion. It anchors itself with the rear prolegs, extends its body forward, and then pulls its hind end up to meet its front end. Thanks to this method of locomotion, these caterpillars go by various nicknames, including inchworms, spanworms, loopers, and measuring worms. Adult geometer moths vary from small to medium in size, with slender bodies and broad wings sometimes decorated with thin, wavy lines. 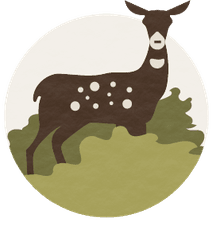 Some species are sexually dimorphic. Females in a few species lack wings entirely. In this family, the tympanal organs are located on the abdomen. Nearly all geometer moths fly at night and are attracted to lights. For those who enjoy confirming ID's using wing venation characteristics, take a close look at the subcostal vein (Sc) of the hindwing. In Geometrids, it bends sharply toward the base. Examine the cubitus of the forewing, and you should find it appears to divide into three branches if you've found a specimen from this family. Geometer moth larvae feed on plants, with most species preferring woody trees or shrubs over herbaceous plants. Some cause significant forest defoliation. All geometer moths undergo complete metamorphosis with four life stages: egg, larva, pupa, and adult. Geometrid eggs can be laid singly or in groups, varying according to species. Most geometer moths overwinter in the pupal stage, though some do so as eggs or caterpillars. A few spend winter as eggs or larvae instead. Many geometer moth larvae bear cryptic markings that resemble plant parts. 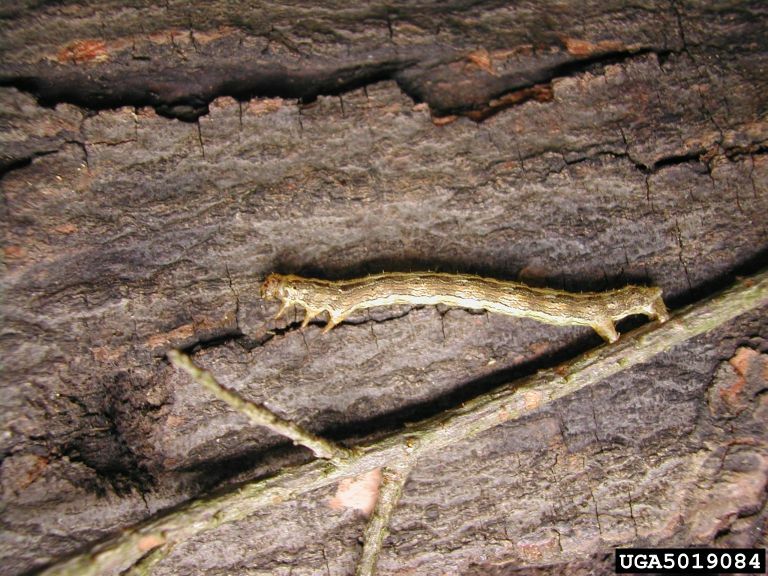 When threatened, these inchworms may stand erect, extending their bodies straight outward from the branch or stem they're gripping, to mimic a twig or leaf petiole. David Wagner notes, in Caterpillars of Eastern North America, that their "body color and form can be influenced by diet as well as the lighting of a given caterpillar's surroundings." The family Geometridae is the second largest among all the butterflies and moths, with about 35,000 species worldwide. Over 1,400 species occur in just the U.S. and Canada. Geometer moths live in vegetated habitats, especially those with woody plants available, and have a wide distribution throughout the world.